Learn how to paint en plein air at Wednesday's workshop, a collaboration between Walking Mountains Science Center and Alpine Arts Center. What: Plein Air Paint Out. Where: Meet at Walking Mountains Science Center in Avon. When: 10 a.m. to 4 p.m. Wednesday. More information: To register call 970-827-9725 or visit www.walkingmountains.org/sp and click on Adult Field Studies; reservations required. AVON — Join Walking Mountains Science Center and Alpine Arts Center for an outdoor painting experience on Wednesday. 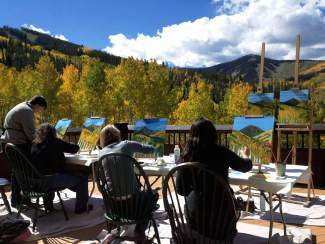 The two local organizations are teaming up for a Plein Air Paint Out in the national forest. Walking Mountains Science Center will pick registrants up at Walking Mountains Science Center in Avon and transport them (and all the painting supplies necessary) to capture the moment in the fresh air. En plein air — or in the open air — is a method of painting that has been around for centuries and there is plenty of open air, scenic vistas and wildflowers to keep even the most talented artist struggling to do the local environment justice. Working with acrylic paints, an instructor with Alpine Arts Center will take you through a step-by-step demonstration and you will leave with your own canvas. Known for its summer camps, drop-in classes and open workspace, the Alpine Arts Center has been providing diverse visual arts education for emerging and established artists of all ages since 2010. Alpine Arts Center specializes in bringing art to a general audience and Walking Mountains Science Center is thrilled to partner with them to merge artists and art lovers in our beloved environment. “Alpine Arts Center is a staple in the Eagle Valley and by teaming up with another educational resource in the area, we can bring our audiences together to provide experiences with twice the capacity, twice the resources, and twice the fun,” said Peter Suneson, adult programs instructor at Walking Mountains Science Center.